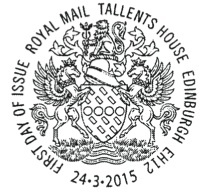 Royal Mail announced its annual stamp price rises in late February and they take effect from 30 March 2015. 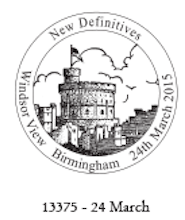 Inland rates will be (previous rates in [brackets] ) - 1st class 63p , 2nd class 54p , 1st Large 95p , 2nd Large 74p . 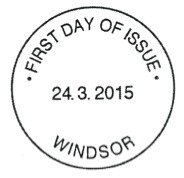 The inland 'Royal Mail Signed For' fee remains £1.10. Airmail rates under 100g are reduced to 2 steps from 3, eliminating the 60g step. 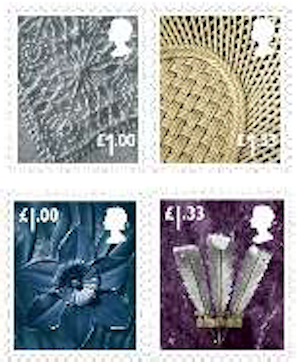 The Europe 20g and Worldwide 10g rate of 97p rises to £1 (a 3% increase) meaning four country definitive stamps, but no new Machin definitive stamp. 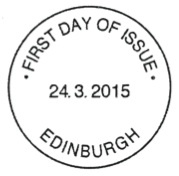 The Worldwide 20g rate rises from £1.28 to £1.33 which means a 4% increase (new stamp). 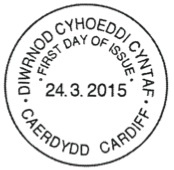 The World 60g rate of £2.15 and 100g rate of £3.48 are replaced by £2.25 (new stamp). 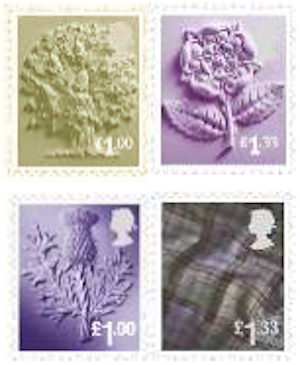 The Surface mail (rebranded last year as International Economy) 20g rate rising from 81p to 85p (no new stamp). 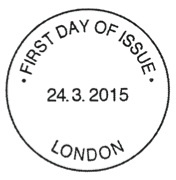 Pricing in Proportion has been extended to International Mail (as predicted several years ago), with new Large Letter 100g rates of £2.25 for Europe, £3.15 for World Zone 1, and £3.30 for World Zone 2, all of which will be served by new stamps. 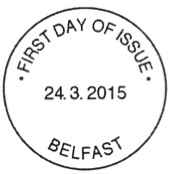 The £3.30 stamp will also serve for the Inland 1kg 1st class Small Parcel stamp. Pre-issue publicity images of the new £1 and £1.33 Country Definitives. 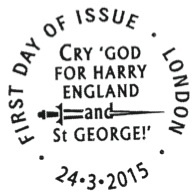 We've doctored the England £1 stamp to show it in approximately the same colour as previous stamps in this design. My apologies for the quality of these pictures. They are actually larger than those provided by Royal Mail, which accounts for the loss of quality. Also I can't be sure of the colours; while most of the Country Definitives are correct, some of the Machins seem to close to each other. The Machin definitive stamps are self-adhesive, printed by De La Rue in gravure in sheets of 25, with 12 sheets of 25 per cylinder. 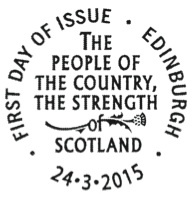 They will have security cuts and the irridescent overprint. 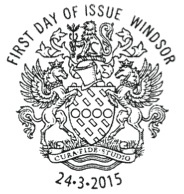 The Country definitives will be litho printed on ordinary gummed paper by Cartor Security Print also in sheets of 25. They will have no security features. 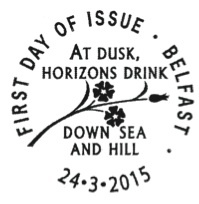 Special postmarks available on the day of issue will be shown here. 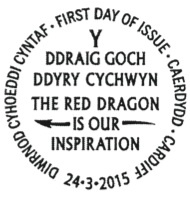 If you wish to be told when this page is updated, please use the ChangeDetection panel alongside the stamps. 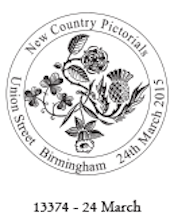 Norvic Philatelics, PO Box 119, Dereham, NR20 3YN, GB.